Focus: All sworn or commissioned officers of any rank. Active or Reserve military personnel. Pre-requisite: Agency certification of basic rifle skills. If you know you are going into a gunfight, you want to take a rifle and a handgun with extra ammo for each. And, if you can, similarly armed friends who are dressed like you and willing to press a trigger. Rifles are for fighting. Any "man with a gun" or "shots-fired" call demands a response with a rifle. This TRAIN-THE-TRAINER course provides the agency firearms instructor with the skills to train officers in the handling and combatives response with the most versatile and accurate weapon in the police arsenal--"the patrol rifle." We present a shift from the thinking that rifles are just for threats at distance. While hitting threats at long range is definitely within the capabilities of the trained officer armed with a patrol rifle, this course focuses on responding to real-world threats--typically occurring at handgun range. Threats at longer ranges (25-80 yards) will be addressed, but the emphasis of this course is to develop instructors who competently train officers to respond with their rifles in short-range (0-25 yards) and in reduced space responsive applications. This course provides your agency instructors with the "how-to's" of teaching your officers to survive against threats where shooting and, more importantly, hitting another person means your officers will go home today. We teach REAL-WORLD tactics that impact your officers, proven over decades and through history to keep officers alive during those violent, sudden, and vicious police firefights. And when your cops are faced with prepared offenders or terrorists who came ready for a fight, their training will be all that stands between mission success and failure. The emphasis of this course is "how-to-teach" your officers to fight with their rifles utilizing only cutting edge tactics and training. You know the real world of gunfights is almost always about hitting the armed Imminent Threat who is from contact to talking distance, and sometimes beyond. It is also true that officers are almost always late because they are forced by the law to respond to suspect behavior. Reaction is always slower than action. Officer's training in tactics and fire employment theory must support this reality--of being close to the Imminent Threat who is trying to kill them, of being late, of the driving need to put rounds on-target on-time, in-time. Officers also face the reality of being physically assaulted by a suspect, and then having to respond to the suspect's extreme actions with deadly force while struggling with the suspect--yes, even when armed with a rifle. Cops need a shooting program that realistically fits their needs and capabilities. This proven program does just that. Sound fundamentals compliment outstanding tactical employment in a program that was designed for your needs—extremely high hit ratios in the field. We have blended a layered method of instruction that is applicable for the average officer with extremely advanced tactics and concepts of hitting and surviving a deadly force event. The focus of this course is the effective and efficient application of the officer’s rifle in real-world confrontations at conversational to extended distances. Too many "instructor" courses turn out to be glorified "end-user" courses where your agency instructor becomes a better shooter, yet fails to become a better instructor. NOT THIS COURSE...our prime goal is to train your agency instructor in how to teach. Some instructional time is taken in "how to shoot." However, the core of this course is in training your police instructors how to teach your officers to be tactically sound while hitting the target in police-combat conditions. Like all of our physical skills domain courses, we utilize a "building block," or layered approach where the instructor-candidate will move progressively through basic tactical instruction into advanced instruction in police fire employment. This includes Live-Fire Combatives© where officers are prepared in both an Airsoft training (utilizing Systema Professional Training Weapon) and in a live-fire environment to physically defend against assault and respond with deadly force. At the conclusion of training, instructor-candidates will be capable of developing and presenting sound tactical and close-combatives training to agency officers that is safe, documented, defensible, and most important of all, effective. CUTTING EDGE TRAINING's Tactical Rifle Combatives remains the only program of its kind--"reverse-engineered" to achieve real-world survival goals. We studied--and continue to study--how officers are assaulted and murdered. Then we put that knowledge together with how the human being inside the uniform actually reacts in the pressure-filled, life and death environment, and created a training system that has changed the law enforcement community's understanding of how to put bullets on-target on-time, in-time. There are no "game philosophies" employed to dazzle shooters at the expense of officers' lives. The emphasis is solely on real-world gunfights: recognizing the Imminent Threat's behavior early enough to make a difference, reacting tactically to avoid being hit while hitting the suspect with combat accuracy. Finally, this course also emphasizes your very real need to defend your actions in the inevitable post-shooting aftermath. Zero dogma is taught or expected. You will never hear "which stance must be used" arguments in this class--that has no bearing on hitting a suspect who is just yards away and already reaching for a handgun in his waistband. Instead, we concentrate on the areas where officers have a real need for training to survive: sudden responses to deadly assault utilizing realistic methods that every shooter will use use. This is the future of police rifle training. Your instructors can begin teaching it today. Military applicability: This course benefits military personnel as well--the experiences of police officers in up-close-and-very-personal shootings are being experienced by our soldiers, Marines, sailors, and airmen in this Global War on Terror. 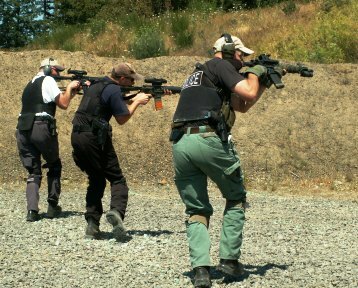 While this course focuses on "police gunfights," the concepts and training are applicable to anyone who carries a rifle into a battle where any range of conflict is possible.